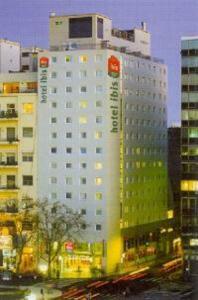 Hotel Ibis Buenos Aires, Buenos Aires discount hotels and accommodation. At Ibis you are welcomed with a smile 24 hrs a day, the staff will make your stay very pleasant. Mordern, confortable, sound-protected rooms, breakfast buffet from 6.30 am., express menu served 24 hours a day and reception desk provides calls, faxes and Internet services. View photos, room descriptions and make online reservations at Hotel Ibis Buenos Aires. Save on room prices at Hotel Ibis Buenos Aires, Buenos Aires.